Do you have a story you would like to share with the University of Virginia community? 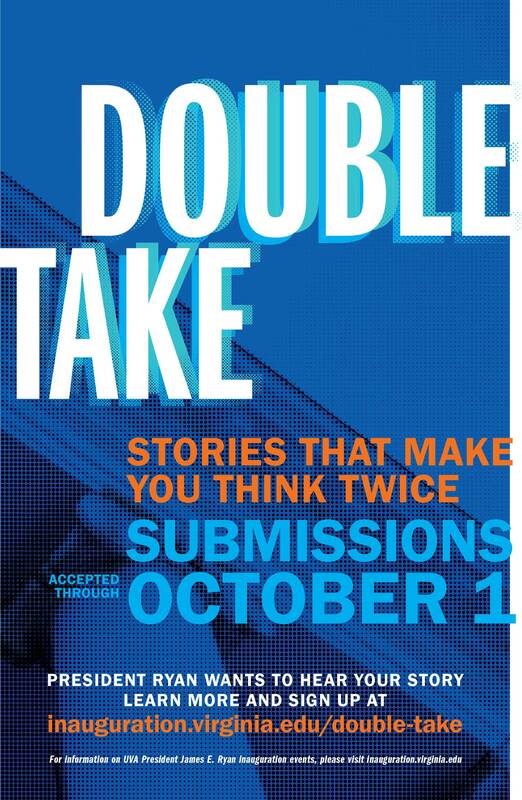 As part of his inauguration celebrations Oct. 19-20, University President Jim Ryan will host a community-wide storytelling event, “Double Take: Stories That Make You Think Twice,” on Oct. 20 from 2 to 3 p.m. in Old Cabell Hall Auditorium. The event is designed to give members of the UVA community an opportunity to share their own stories and learn from others’ personal stories and experiences, and will feature students, faculty and staff from across the University. The theme will focus on “building bridges,” an idea that Ryan has repeatedly cited in his public remarks as central to his mission and goals as UVA’s president. “I have always believed in the power of a story,” Ryan said. “Good stories can teach us, persuade us, or help us see the world in ways we didn’t before. And when we tell stories about ourselves, they help other people understand who we really are. Anyone affiliated with the University can submit a story for consideration, either in person or digitally. To submit a story in person, participants can visit the Story Stream trailer parked between Newcomb and Madison Hall from Sept. 24 to 28, where staff will be available to record submissions. Participants can also sign up for a limited number of recording times at Madison Hall. Coaching and peer feedback will be available in both places. Digital submissions can be made through a UVABox account to inauguration@virginia.edu. Digital submissions will be accepted through Oct. 1. Once submissions are collected, a committee of students and staff will choose 10 speakers to join Ryan and alumna Dr. Vivian Pinn. Pinn, the only woman and the only African-American in the School of Medicine’s Class of 1967, went on to become the first director of the Office of Research on Women’s Health at the National Institutes of Health. Pinn Hall, a medical research building on Grounds, was named in her honor in 2017. Like the other public events planned around the inauguration, organizers hope that Double Take will provide an opportunity for the UVA community to come together, listen and learn from one another’s different experiences.